Jagex Games Studio, makers of the multi-award winning fantasy MMORPG RuneScape, and global toy and games company Hasbro Inc., today announced the launch of the TRANSFORMERS Universe Founders program, giving TRANSFORMERS fans a chance to be immortalized in the Founders Honor Roll, reap in-game rewards and currency (‘relics’), the opportunity to secure a strictly special edition TRANSFORMERS Universe figurine, as well as other high-value extras. There are four available packs on offer to players — bronze, silver, gold and cybernite — and all Founders will be immortalized in the Founders Honor Roll. 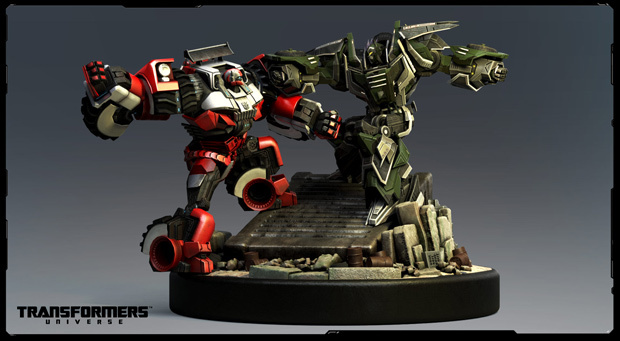 The packs themselves are competitively priced, with full details now available at http://www.transformersuniverse.com/founders-pack, and offer players scalable value-added extras. The extras are fully dependent on the pack purchased, but will range from equipment bundles, warrior upgrades and in-game tools, through to exclusive warriors and body kits. Founders will also be awarded in-game currency, season passes, free access to timed-exclusive warriors at launch and other in-game bonuses. For those Founders taking advantage of the top level cybernite pack they will receive a 50cm tall TRANSFORMERS Universe figurine that has been specially commissioned for the game, with a very limited worldwide run. All Founders packs, of varying levels of value and content, are priced accordingly and are available for purchase today, Wednesday, April 30, guaranteeing all Founders a place on the Founders Honor Roll along with an exclusive Founders forum avatar immediately on purchase. Full details, including pricing, can be found at www.transformersuniverse.com/founders-pack. Tagged Announces, Founder’s, Jagex, Packs, Transformers, Universe.